Selkirk's captain for the day, Euan MacDougall, gets to the heart of the action (picture by Grant Kinghorn). Selkirk manager Tom Ramage described the concluding Saturday of the league season as “a huge disappointment” as his side’s bid to finish with a flourish fizzled out. Selkirk were at home to champions Edinburgh Accies in their last League One game of the term and wanted to sign off with a positive, robust display. They knew Accies were formidable opposition but indicated beforehand that they (Selkirk) had nothing to lose – and a good performance might even see Accies’ ‘lost’ column doubled in the final league table. The capital side had won every game in the 2017-18 league campaign except one, when Borders side Jed-Forest beat them 22-6 last month. But it wasn’t to be for Selkirk, as Edinburgh scored 26 points in each half and grew stronger as their tally increased. Selirk could only manage a Darren Clapperton try, converted by Josh Welsh, for a 7-52 defeat. There was some consolation for the Souters the next day, reaching the final of the Berwick Sevens, but, for Ramage, it was not the end to the season he’d wanted. “Good luck to Edinburgh Accies – they came down willing to play open rugby and they did,” he said. “They scored some nice tries. “We had a weakened side out but I am not even taking that away from Edinburgh Accies – they played some nice rugby and I wish them well next season. Key parts of Selkirk’s game went wrong on the day, added Ramage. The lineout didn’t function and, with three hookers out, emergency cover had to be drafted in, while the scrums were “just going backwards all the time”. 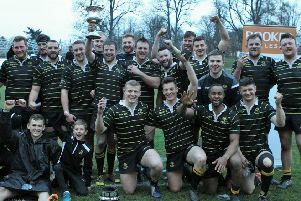 The day took its toll and left Selkirk with only nine players for the Berwick 7s but they nevertheless got to the final, where they lost to Watsonians. Ramage believed they could do well again this weekend at Langholm.